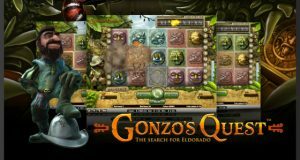 If you’re ready to play a slot game that has a Spanish twist to it then you are ready to play Gonzo’s Quest. It has a theme that is based around the lost city of El Dorado and is presented in a 3-D visual which adds to the excitement and enthusiasm of slot playing. The main character of the slot is Gonzalo Pizzaro. The one unique feature that you will see about this particular slot is that the reels don’t spin but instead drop into place. Once you have settled in for some real fun playing with this Gonzo’s Quest slot machine you are going to be playing a 5 reel 20 pay line slot. This has been provided by the Net Entertainment software providers. The coin range is from two cents up to one dollar and you are able to place a max. of five coins per line for your bet. The minimum bet that you can place is $.40 and the maximum is $100. Your bet placement is going to dictate just how much money you can win and of course a max. the bet is going to give you the biggest payout. While there are many different colored icons that you have the chance of collecting and setting up on a pay line, you really want to watch for the blue icon which will be the face with large earrings. If you manage to get five of these on your pay line then you are going to be given 2,500 coins. To help increase your wins there is a wild symbol that will substitute other icons on the reel, and another added feature is the Avalanche feature which can help to take one win an increase it into many more. The free spin feature is also unique on Gonzo’s Quest compared to other slots that offer free spins. This is due to the fact that the reels don’t spin here but drop into place instead, what you can gain here is a free fall round. What you will need to do to gain this is collect three or more of the golden icons in the win lines to activate 10 free drops. There is a three times multiplier that will be added to each when you produce during your free play. However, there is also an opportunity to gain as 6×, 9 x, and 15x multiplier. To expand the fun the free fall round can also be re-triggered during this free fall play.